Ben takes a bullet for his no-nonsense brother-in-law James in the hilarious second trailer for Ride Along 2. 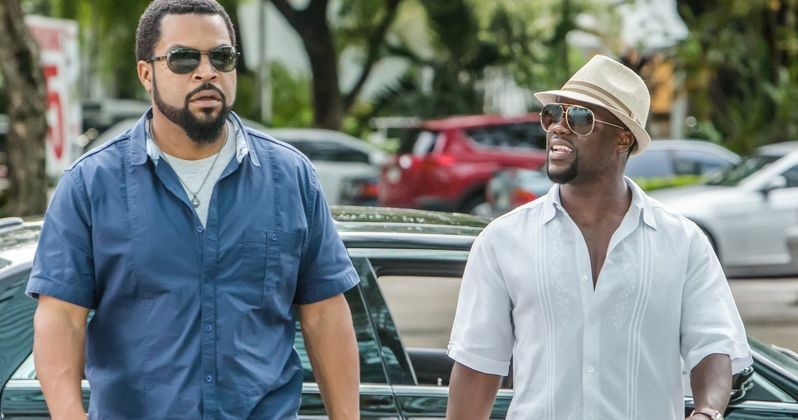 The sequel pairs Kevin Hart and Ice Cube for an all-new mission, which sees them heading to Miami to take down a notorious drug dealer played by Benjamin Bratt. There's plenty of new footage in this latest sneak peek, which hints at the laughs, action and thrills that will be on display this winter. Kevin Hart and Ice Cube lead the returning lineup of Ride Along 2, the sequel to the blockbuster action-comedy that gave us 2014's most popular comedy duo. Joining the duo for the next chapter of the series are director Tim Story, as well as Ice Cube's fellow producers, Will Packer, Matt Alvarez and Larry Brezner, who will produce alongside Cube. The rest of the cast includes Olivia Munn, Ken Jeong, Nadine Velazquez and Tika Sumpter. The original Ride Along opened in early 2014 and was a smash hit, solidifying Ice Cube and Kevin Hart as a new comedy duo not to be tangled with. The film pulled in a healthy $134.9 million from a low $25 budget. A sequel was announced almost immediately, and will be released only a short two years later. Take a look at this latest footage, which features a hilarious scene involving Kevin Hart and a ceiling fan, along with more insight into the story this latest adventure is setting out to tell.